The Piedmont Triad is the 3rd largest metropolitan area of North Carolina, and the 33rd largest in the United States. 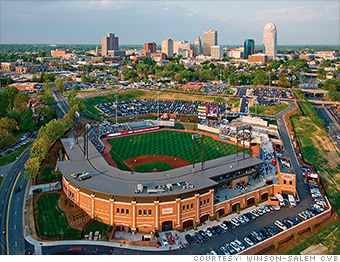 The Triad is home to Winston-Salem, Greensboro & High Point. All three are storied cities with unique legacy industries that helped define the region. Structural Innovations Engineering & Consulting, PC has been providing both Structural Engineering & Structural Inspection services to Winston-Salem, Greensboro, High Point and all other communities contained within the Triad since our inception. Structural Innovations Engineering & Consulting, PC provides a wide range of structural inspection services in the Triad area. For the residential market, we perform structural observations for single-family homes along with FHA / HUD foundation inspections for manufactured homes. Our structural inspections for single-family homes cover the major problem areas of a home or any specific problem that may have been observed by others. We will perform engineering observations of crawl space foundations, basement wall foundation, visible wall and floor framing along with roof rafter / roof truss framing. We also provide structural inspection and forensic investigation services for commercial buildings and parking decks. Many property owners of buildings, and specifically parking decks, do not realize that a structural inspection program is critical to extending the life of their structures. For a minimal fee, a structural inspection helps to offset large capital expenditures by detecting structural problems early. Please contact us and see why Structural Innovations Engineering & Consulting, PC is one of the leading engineering firms providing structural inspection services in the Triad.